This story starts more than a decade ago, at the Frankfurt airport in 2006. Things were not going so well at the time. I had just picked up a then-new BMW M6 V10 at the factory, and after a few days and a few thousand kilometers of driving around Europe in the big GT, I’d finally made it to the Nordschleife. As most first-timers soon learn, the hundreds of laps driven on racing simulators do little to nothing to prepare you for the full experience, for the elevation changes and their attendant compression, the changes in the track surface from one sector to the next, or for the deadly bumps and divots that pepper the 14 miles of forested race track. On my final day, and after I’d completed some 44 laps, I noticed that the track was open for a rare morning of touristenfahrten rather than the typical afternoon schedule. I was hooked at this point, and so I went out for one last session. I’d put in a lot of laps of the past few days, but none in the early morning and its dense shadow and fog. Every corner looked different at this hour, and especially the last one. It was there that I forgot the requirements of the turn, and I ended up in the armco. As I emerged uninjured, I got a jolly horn toot and a wave from Sabine Schmitz in the inimitable and pitiless manner of the ‘Ring’s veterans. So, I am back in the airport. Before boarding my flight back to Canada, I reflected on the M6 and my recent experiences. It was, and is, a brilliantly quick road car, but regardless of my memorization, it’s too heavy and the brakes are too weak for it to be a really formidable track car. I noticed that I didn’t see any others out there on the course with me, but I did see a lot of GT3s, which led me to seek out a lap in one. I managed to get a passenger lap in a fully race-prepped example, and I was astonished by the car’s capabilities. That could be considered my gateway into the world of GT3s, but I think the catalyzing moment came from that day in the airport. I had picked up an auto magazine and flipped to the review of the new 997 GT3 RS. A day after I landed at home, I visited my local dealer and, fittingly, spoke with Antje, a German sales rep, about ordering a new GT3 RS. Apparently this was me dreaming, as my inquiry was met with: “I’m sorry to say, all of the 2007s have been sold.” No worries, I would order a 2008 model and wait a bit longer. “Umm, sadly, they are all spoken for too.” I spent many months dropping by that dealership, looking on with envy at the occasional new delivery of the car I was anxious to own. Over a year would pass like this, and then a call came in. “It’s Antje. I have a cancellation, and it will be gone in the next ten minutes.” It only took me ten seconds. 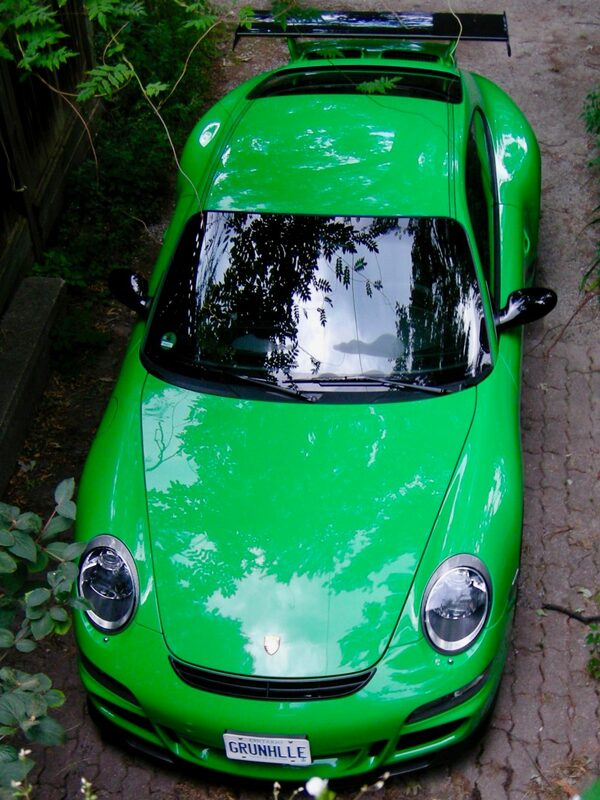 The car perfect, and it was even Viper green, the color I’d wanted in the first place. I had the bank courier the money over, and by end of the day car was insured and ready to go. It was almost winter in Canada though, so there would be little chance to use it properly for some time yet. In May of 2008, with the arrival of spring, I shipped the car right back to where it came from: Germany. 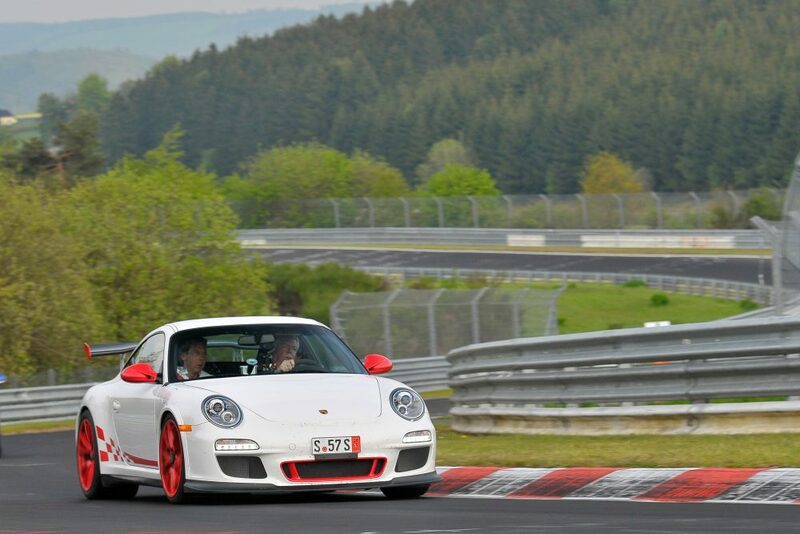 After my first trip the ‘Ring, I could not shake it out of my system. Some people get addicted to the track and actually move to one of its surrounding towns in order to stay closer to it, and I can imagine why. 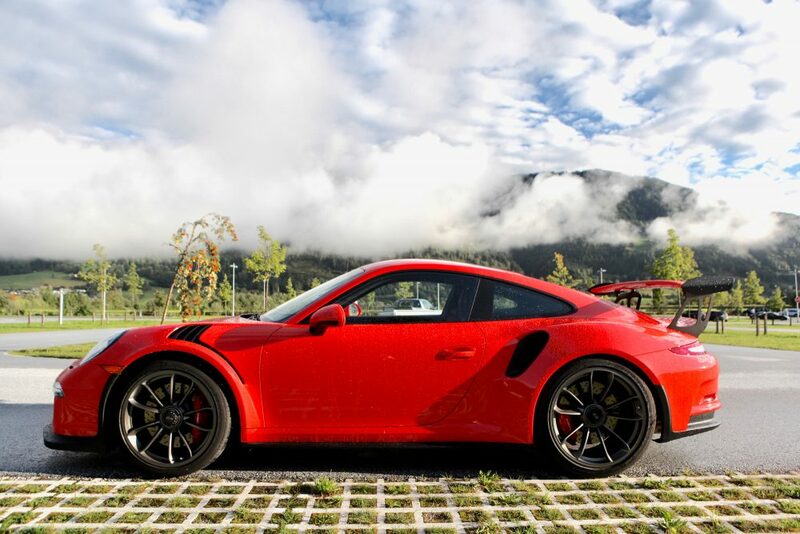 Picking up the Porsche in Frankfurt, I had my first opportunity to drive on some twisty Alpine roads along with some big-grin early morning Autobahn runs. In dry conditions the grip was superb on the Michelin PS Cup tires, and on an early rain-free morning I managed a V-max run. I learned that when driven flat out to the last slice of the speedometer, the RS had pronounced lift and scarily light steering; this run was not repeated. However, below 280km/h, the car was completely planted. On my way to the track, near Cologne, I encountered a heavy rainstorm that washed across the Autobahn and left me with minimal grip. The car is tricky in heavy rain, and the big 305-width rear tires aquaplane like you’d expect a wide performance tire to: easily. I watched a Golf GTI spin right past me in the storm and slide backwards down to the barrier. Needless to say, the trip to the track was very restrained. After picking my way through the weather, I eventually arrived and checked into the Hotel Am Tiergarten right next to the circuit. 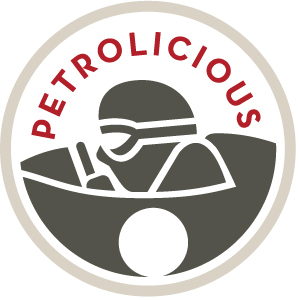 This is also the site of the best racing restaurant I’ve found: the Pistenklause! Every evening it was packed with people both well-known and just passing through, and talk centered on the obvious subject of cars. Test teams, racing teams, engineers, and amateurs just visiting for the weekend all huddle around and chat nonstop automobile, and the restaurant itself often joins in the conversation, what with its walls coated in autographed photos and other assorted automobilia. One such patron of the well-known contingent here is Ed Healey, a local man who’s clocked literally thousands of laps in the Green Hell. 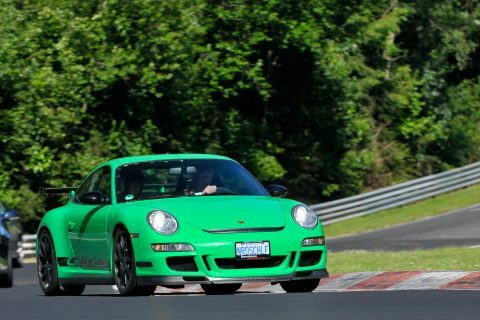 The next day, he would drive the first few laps in the GT3 while I rode shotgun and tried to absorb as much as possible. The following day showed itself as a sunny one, and we headed out into the crisp spring air for our first lap. 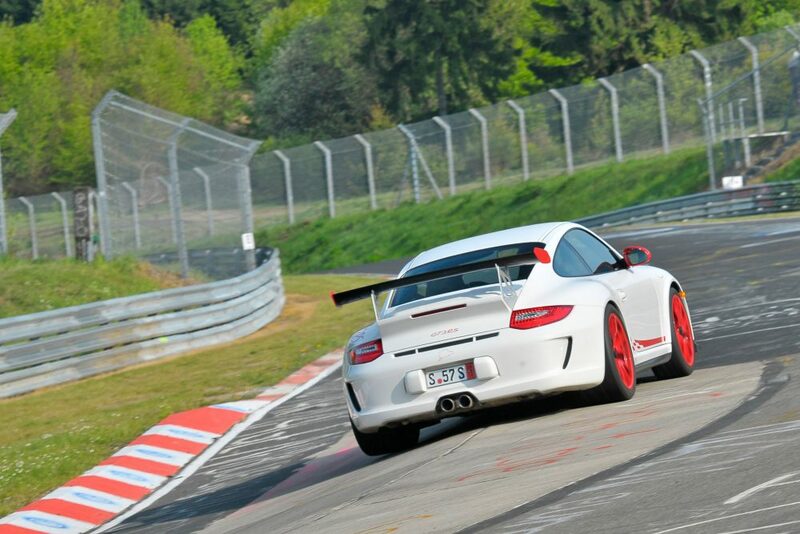 Ed had a lot of experience with GT3s, and it showed immediately. He was just fast. On the approach to every corner, I was sure it would be a disaster, and on every exit I was smiling at my naivety, or at least smiling as much as the G-forces would allow! 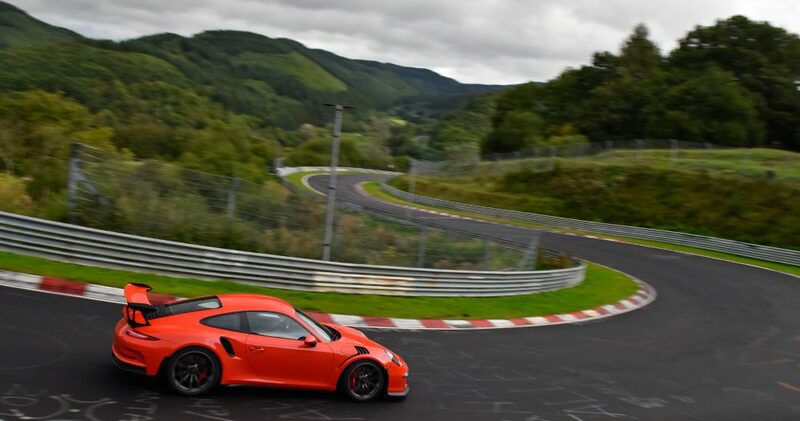 There is no room for error on the ‘Ring, especially so in the back half where it gets really tight, but throughout all of it Ed was maintaining a blistering pace with the kind of ease that only truly skilled drivers can manage. Then it was time for me to take a turn in the left seat. I had none of the overconfidence of my first visit, an in fact have never had it since. 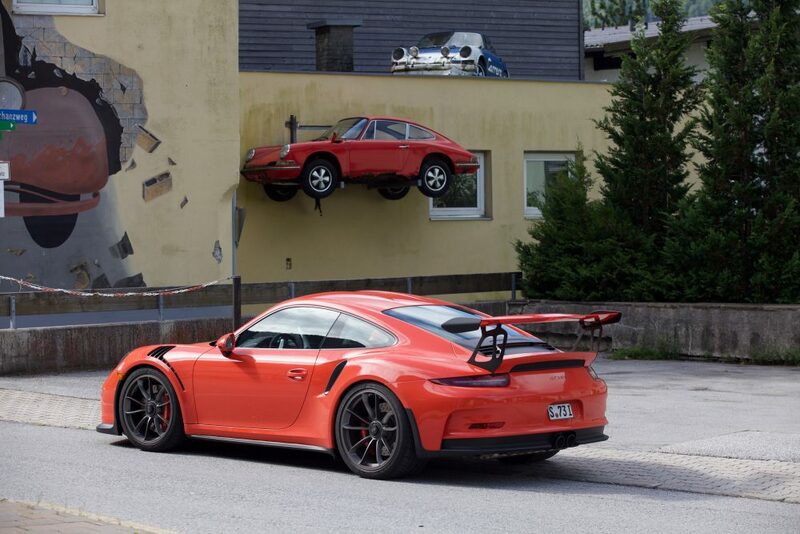 Knowing that there was no stability control on the GT3, and how many accidents happen here, the first day was spent as a gradual familiarization process. Ed and I reviewed the performance after every few laps until I was minimally competent to drive my car at speed. On track, the GT3 RS was a revelation. It was made for this. The brilliant Mezger motor, the balance achieved even though it’s got the aforementioned motor over the back axel, and the simple six-speed manual all make the perfect marriage and the perfect car. To me, there could be no improvement. I spent a week driving the car on the track, and every day was a dry one. And every evening was spent at the Pistenklause reviewing my drive with Ed, who pronounced the RS as one of the best he’d driven. As a local, he seemed to know everyone, and it was clear that this place is so much more than just a track. It is a community, and it attracts newcomers and veterans alike to come be a part of it. I then noticed a familiar face behind the bar. It was Sabine, whose family owns the restaurant, pouring a draught. I ventured over to Spa after that week at the ‘Ring before returning the GT3 and myself to Canada. It’s been a part of my garage ever since, going on just about a decade now. Aside from regular maintenance, repairs have been few and mostly limited to the front lip being replaced. It hangs low, and living in a city center there is simply no way to avoid scraping it on ramps and bumps from time to time. Splitter #6 was just recently fitted in fact! The only big issue I’ve had was an odd early clutch failure, but besides that it’s been just about perfect. As my first RS, I cannot bear to part with it, but it doesn’t mean I can’t have others! 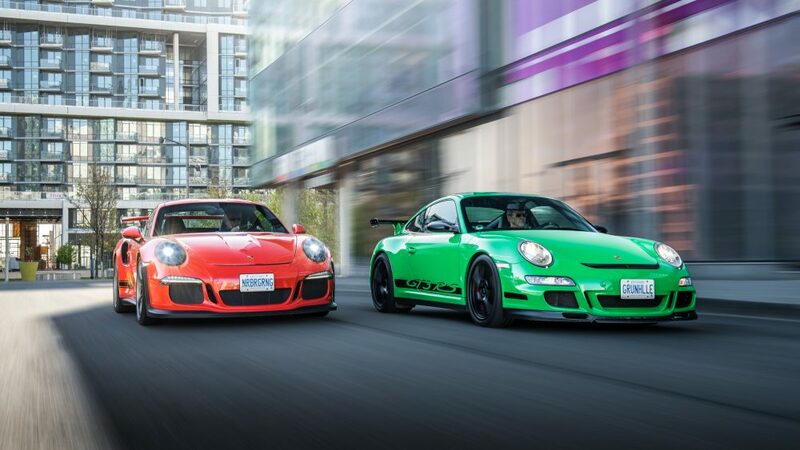 Fast forward to May of 2010, and the rumor mill was churning out a warning that the next version of the GT3 RS would be the last to be offered with a manual transmission. As we know now, that wasn’t proven to be true, but at the time it felt pretty dire. I’d kept in contact with the rep Antje Grey who helped find my first GT3, and this time I would try to get a factory delivery in Europe. 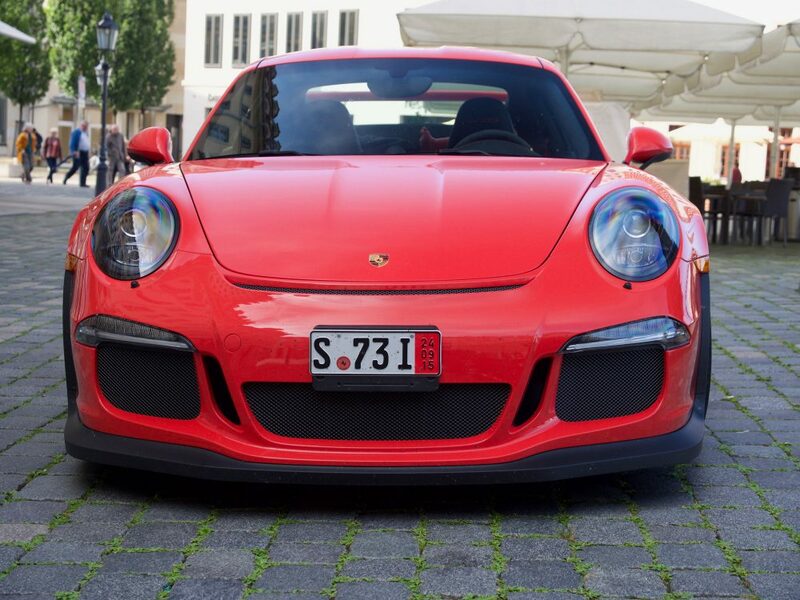 As always, there were more buyers than cars, but I received a call—I would be getting one of the 997.2 GT3 RSes. I could spec it out immediately too. I chose proper sport seats, a thicker steering wheel, a front lift kit (no more replacing splitters! ), and some other interior upgrades. The white paint adorned in the loud red decals bore a striking resemblance to a U-Haul truck, but I loved the disregard for subtlety it represented. Porsche factory delivery is an efficient process, as one might hope and imagine it to be. 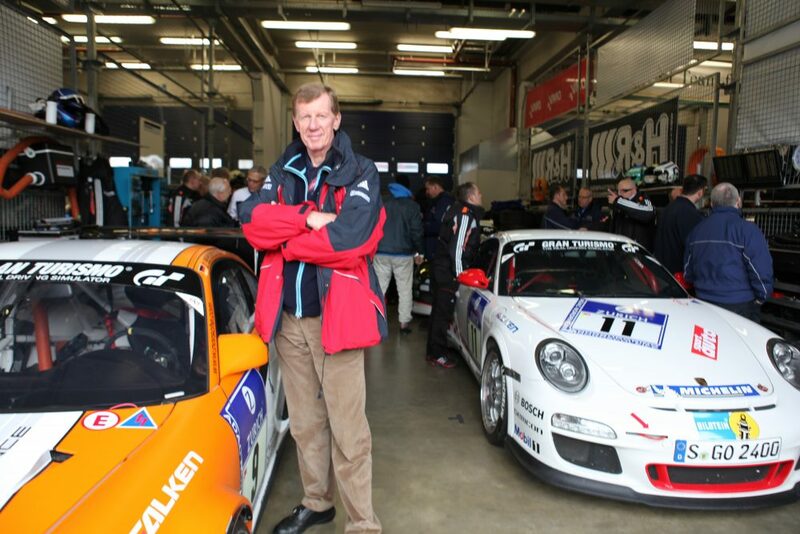 It includes a tour of the factory, a nice meal, and some time at the Porsche Museum in Stuttgart. It’s an impressive factory tour because besides the cars coming out of it, the atmosphere is pretty intriguing itself; it is one of clinical cleanliness and almost complete robotic silence, though a few bits are still done by human hand. For instance, while the leather is cut by water jets, the actual stitching is done by a person with the requisite skills to do a proper job of it. At normal road speeds the 997.2 was very similar to the 997.1, both employing a surgical level of precision to every movement you made with the wheel and pedals. It also had the same Mezger rattle at idle, a sound I’d already grown to love. It is Pavlovian, that noise. 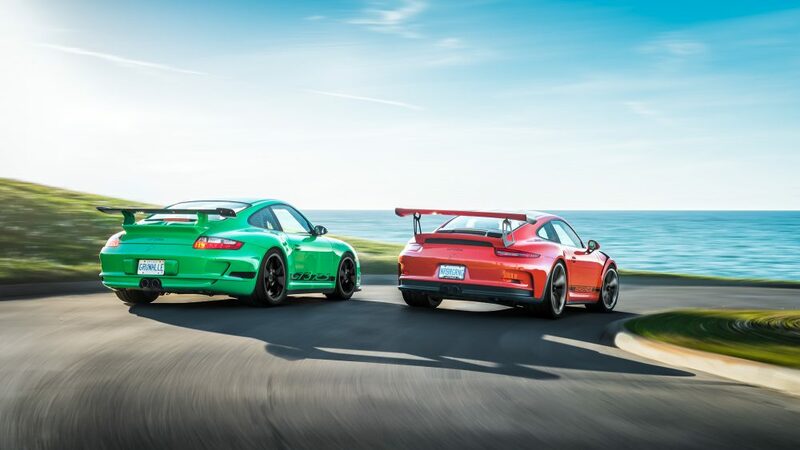 It signals exhilaration to come, as it did in the first GT3 I purchased years earlier. Yet, as the miles wore on, the differences between the two cars emerged. On my requisite V-max Autobahn run, the improvement was massive. The revised aero package stuck the car to the ground now. No lift whatsoever at 310 km/h. The very supportive seats transformed the driving experience further, adding a supreme sense of focus and seriousness to an equation already rife with feedback. The 475bhp output was an improvement too, but this was less evident in normal driving. It was the week of the 24-hour race at the Nurburgring, and the party atmosphere was electric, the Pistenklause packed. 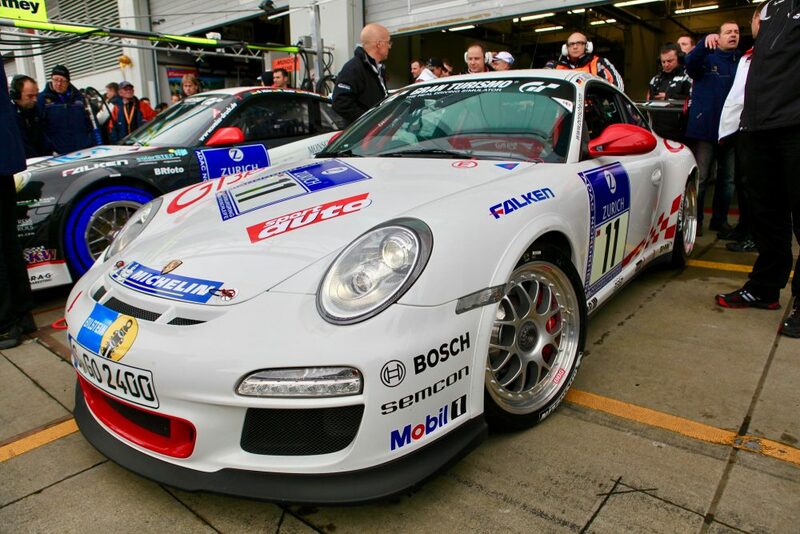 I was especially eager to attend as Porsche had entered an identical car to mine, unmodified save for stickers and safety gear, against the pure racers from Porsche, BMW, and others. Fun fact: among this Porsche’s drivers was a one Chris Harris. He and the other drivers would finish a very credible 12th. After the 24, I had a chance to park next to the formerly pristine car. Now there was hardly an undamaged panel. The 24 Hours is a brutal race, and I can only fathom what it must be like to run it at racing speeds with other cars in the dark or in the rain, or in both. There was also a chance to meet someone who also knows a thing or two about racing. Perhaps bolstered by the race recently run, I wanted to have Sabine Schmitz take some laps in my new car, and so I made the short trip to her farm, where she has her garage and her helicopter pad. She asked that the her mechanic first check the hubs. “Why?” “I own an identical car, but I know that a wheel came off of another one. We think there might be a flaw.” After I returned to Canada from this trip, a year would go by until the recall notice came through to have the hubs replaced. Sabine knew in a matter of weeks that this was an issue. Thankfully my car was fine on that day, and after the mechanic gave the OK Sabine got in and we were back at the track. Professional drivers are absolutely fascinating to watch at work. The minimal movements, the calm concentrations, the lack of corrections needed along the way, the sense of smooth speed. I thought back on the many times I’ve approached a corner less than perfectly, and seeing what the car could accomplish in the right hands, I found even deeper respect for the skills of people like Sabine. A couple of days later the track had been cleaned up from the racing, and it was time for me to try the new car. 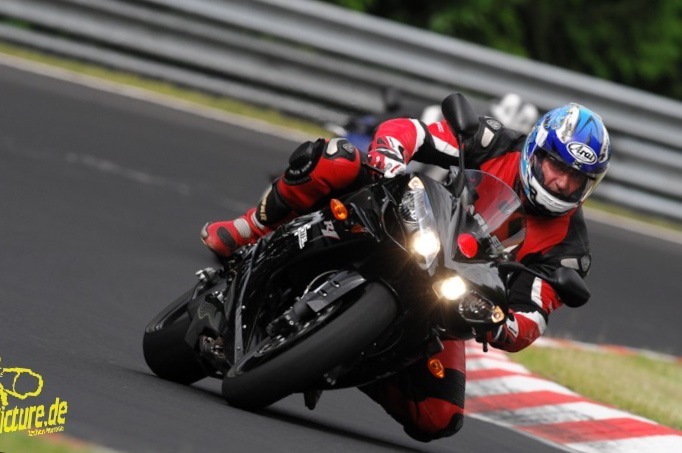 As I now did every time I go, I first spent a day on the track with a professional instructor. 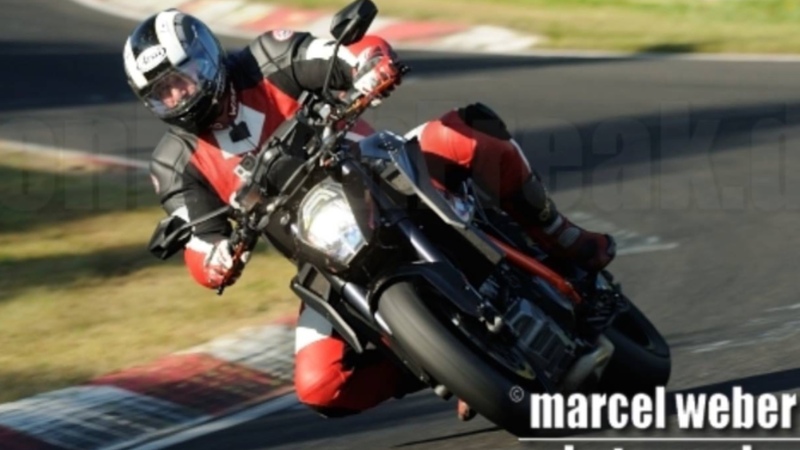 I would be riding along with Markus Gedlich this time, who was formerly chief instructor for BMW and is a current Porsche racing driver. He fit the car with video and telemetry equipment, and we were off. 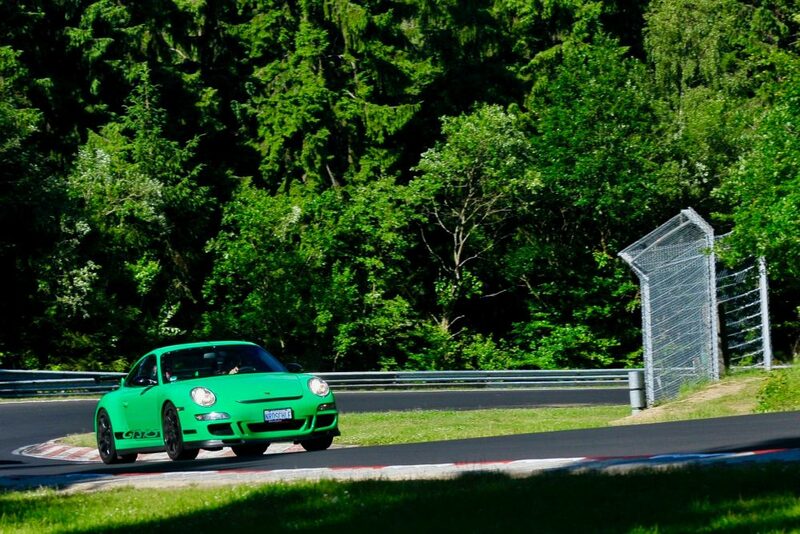 Immediately, it was clear that the 997.2 was a grippier car than its predecessor. It was superior in every way on track, and I couldn’t wait to see what I could do with it. Markus put in some enthusiastic laps first though, and we reviewed the video and the stats afterwards before I switched seats. For the first lap, I had the familiar mixture of fear and excitement brewing in my stomach and brain, and as the day wore on we stopped to review my good and bad performances. Markus was very calm and direct, and by the end of the day I was ready to go it alone. Unfortunately, at the end of the trip when it was time to wrap up the week, the weather took a nastier turn. 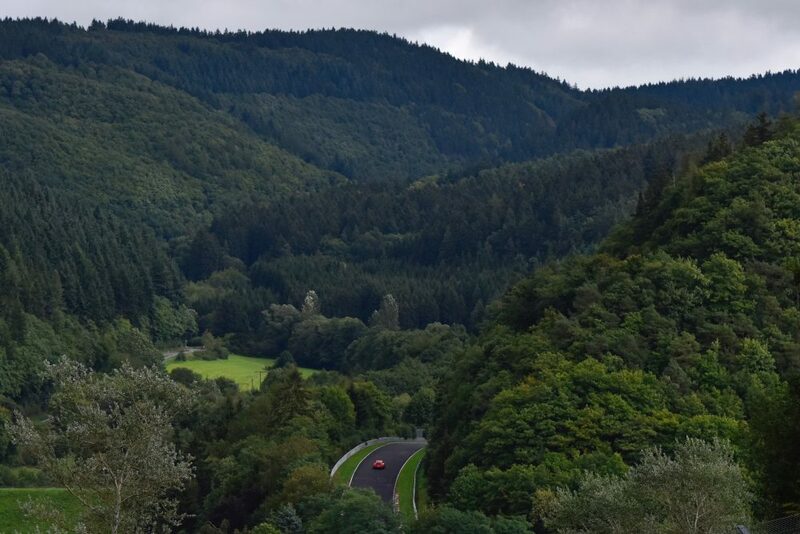 The ‘Ring snakes its way through the Eifel Mountains, and it is common knowledge that this can render some parts of the track clear and sunny while others are wet and dark. This time it was raining practically everywhere, and it was at a level that we can call torrential without being hyperbolic. It was also getting dark. I deliberated for a while on whether I should go out at all, and decided that I should at least give an attempt. For starters, the new car had more grip than the previous one, and it also had stability control, which I hoped to not rely on but liked knowing that it was there. The track was downright greasy slick, and the minimal runoff areas give even more weight to each turn, the vulnerability so much greater in this weather. The memory of the M6 hung in my head during all this of course, but I had far more experience now and a car that was better suited for the environment, so I gave it a go. Early in my lap I noticed a set of bright lights coming up quickly in my rearview, and so moved over to let the Carrera GT pass. He was impressively fast until he wasn’t. Two minutes after he overtook me I came upon the car with its rear wheel almost shorn completely off. The rain was also getting quite gnarly, so it was a good time to say goodbye once again to the Nordschleife. As always, I was eager to return before I’d even left the last road sign behind. I couldn’t wait to come back in the future. The future would not come until 2015. 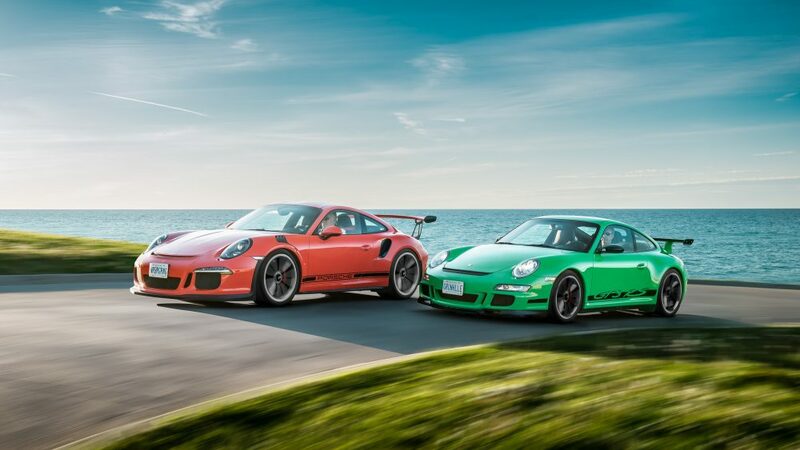 The year prior, the rumor mill had cranked to life once again as it does in the Porsche world when new products are imminent: there would be a new, more extreme 991 version of the GT3 RS coming soon. A convert to the GT3 by now, I ordered one sight unseen. Over the previous four years I had thoroughly enjoyed my two 997s; the later car, the white 997.2, was unquestionably superior, but there was not doubt that the cars were not fundamentally different. A new generation of the car would provide that difference that these two barely had, so with mixed feelings I sold the 997.2. The fact that it had zero depreciation made the tough choice a bit easier, granted. 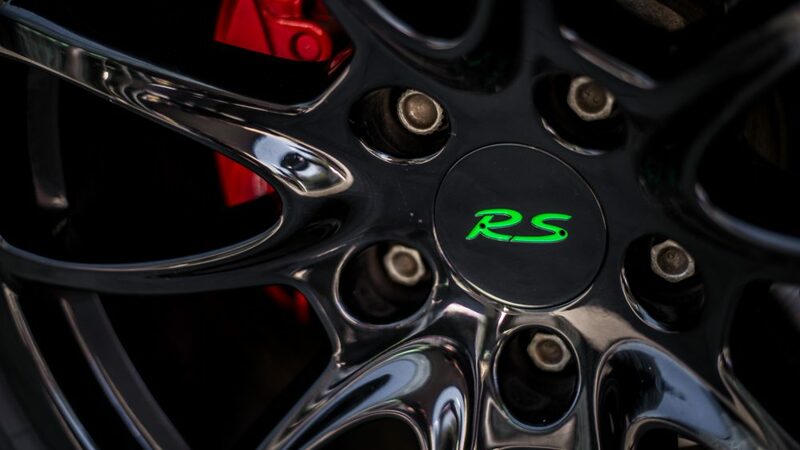 Not being an investor in cars I don’t find much enjoyment in market discussions, but I will say that the RS experience to date has been less expensive than I imagined. Apart from the recall for the new hubs, the car had been completely bulletproof. With the new one though, as always, there would be no certainties until I got the official call from Antje. 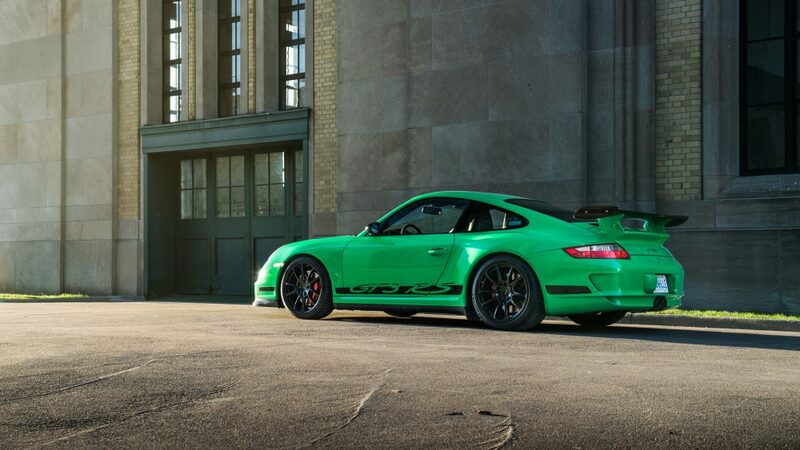 When it came for the 991 GT3, I enjoyed some champagne and giddily anticipated my new car. 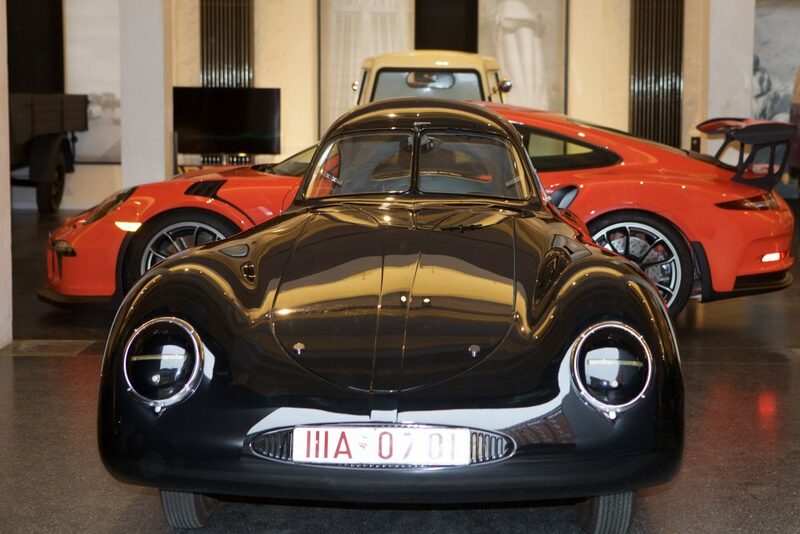 It was to be delivered at the factory again, but this time coinciding with a very special event nearby: a meeting hosted by Dr. Wolfgang Porsche at his home in Zell am See, Austria. First I picked up the car. It was in fact very different than the either of the 997s. 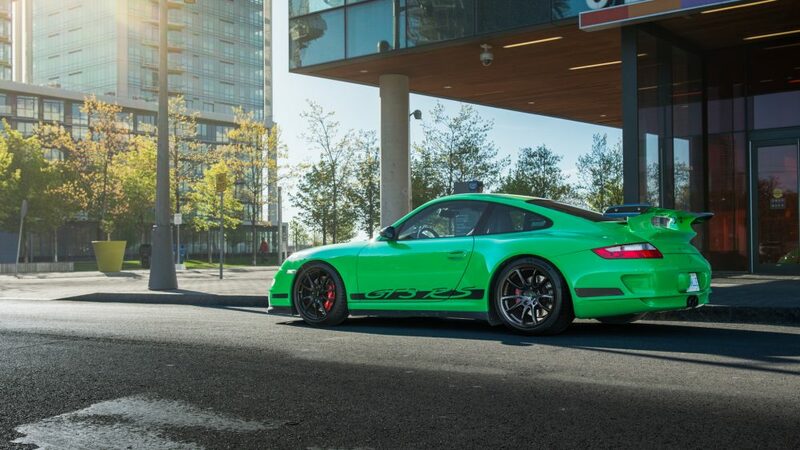 It had 500bhp for instance, a carbon fiber front end that went all the way to the A-pillars, a magnesium alloy roof, PDK (for better or worse), four-wheel steering, and the biggest wheels ever fitted to a 911. It looked scarily aggressive. Its spec sheet was scarily aggressive. In all it is just a more formidable object than the cars it evolved from. And later, while revisiting the Porsche Museum, I noticed an identical green 997.1 GT3 RS to my own, now on display firmly as an artifact of the past. How things change. Anyway, back to the moment at hand. I had the new car’s paint wrapped the same day locally and then I headed for Zell am See, a small alpine town by a lake named Zell. 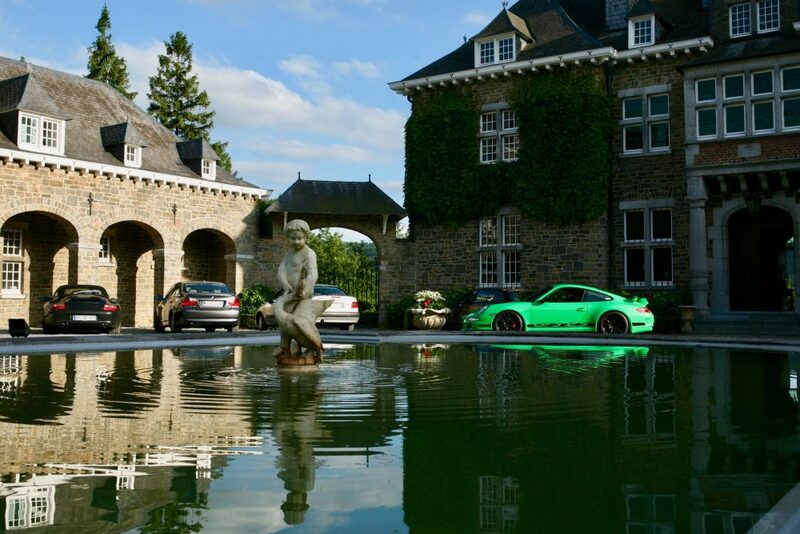 Here in the 1930s, Ferdinand Porsche bought his farm to test tractors and off-road vehicles, and he made it his home. Approaching the village in the modern age, I saw all sorts of Porsches still running about, some of exceptional rarity. 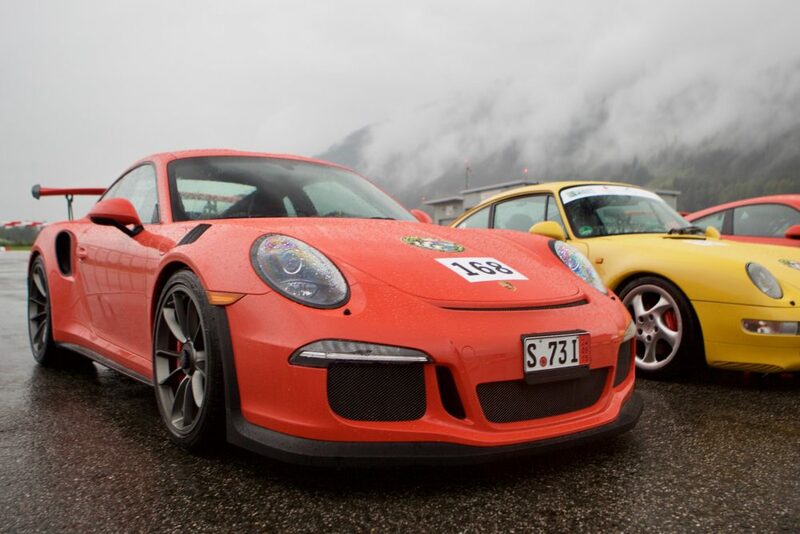 The event itself, the reason I’d come, was hosted by the Porsche Club of Graz Austria, with a rally, autocross, and a series of driving excursions in the Austrian Alps planned. Dr. Porsche attended most of these events. 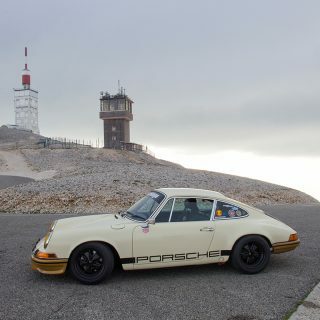 At one point, driving hard between a 993 RS and a 959 down the mountain roads where the first Porsches had been tested, the connection to the past was very vivid, and the sense that these cars were made to be driven hard was inescapable. 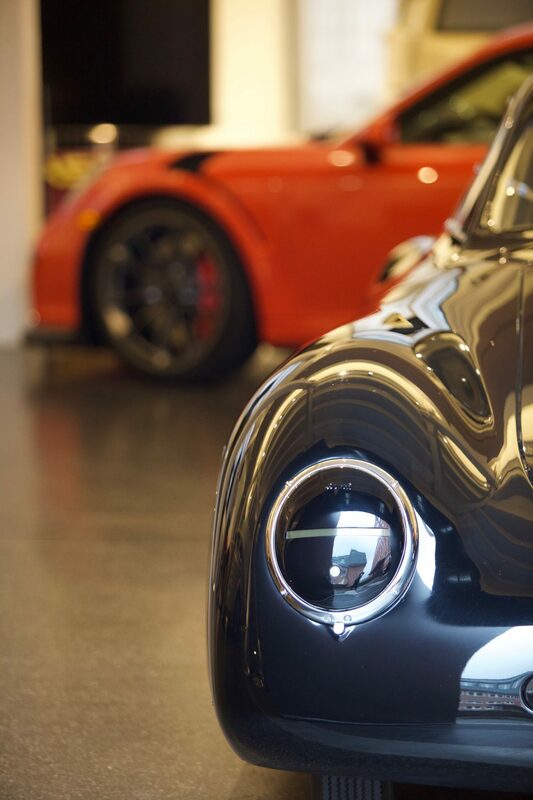 It felt very significant, and it made me feel the gravitas carried in the Porsche name. 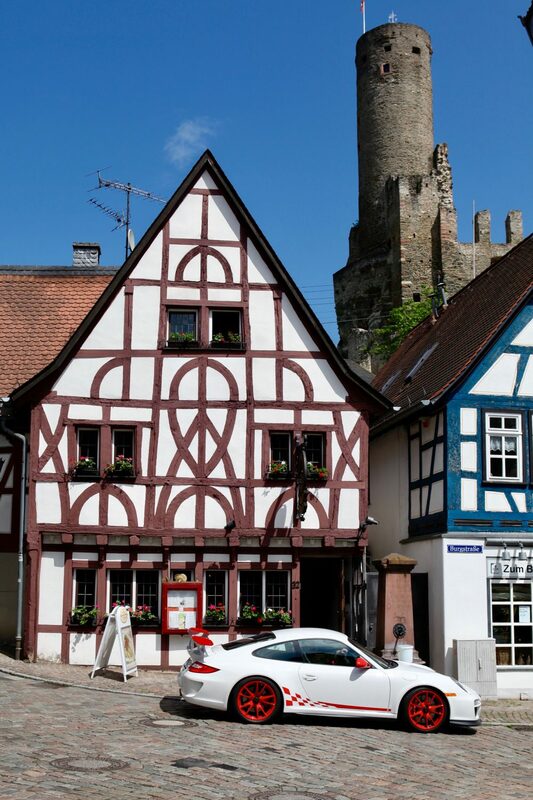 Later in the week, I would visit the Porsche home. There is a small chapel beside the large, simple Austrian residence. Inside are interred Ferdinand Porsche, Ferry Porsche, and their families. The house is now the property of Ferry’s son Wolfgang, current chair of Volkswagen AG. A modest man who spoke sincerely about his appreciation for the car owners who attended the event, he had a little surprise for the evening: over dinner, a curtain was raised, and there stood the 24 Hours of Le Mans trophy which Porsche had won for the first time in decades. His pride was evident. 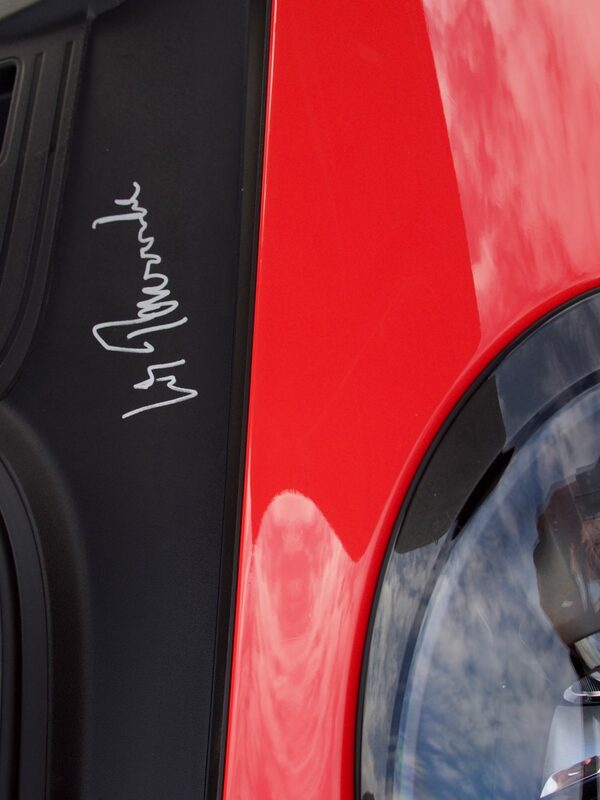 After the evening ended, he autographed my new car, giving it a further link to its heritage. I left Lake Zell and headed back to Germany for a stop at a special shrine of air-cooled history. Museum Prototyp is a small but captivating automotive museum in Hamburg, a long drive from Austria. 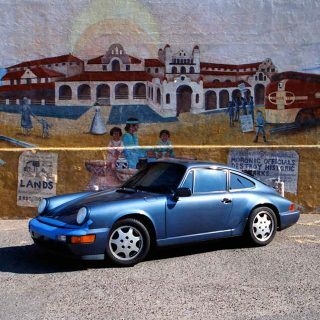 Here, two enthusiasts over the course of many years have assembled a peerless collection of early air-cooled cars, with many coach-built examples of VWs and Porsches making up the impressive roster. The jewel of the collection however is a 1939 Porsche Typ 64. It took a decade to rebuild the car which had lost its body, and the result is a tiny but stunning car in black cellulose. 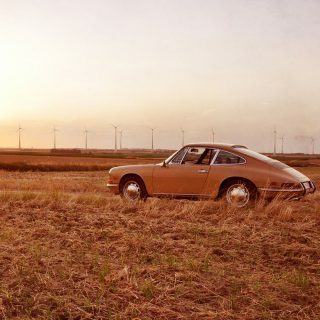 Although the official first Porsche was in 1948, this car, originally a VW brand, was re-registered by the family as a Porsche in 1946 and is the true possessor or the title of first Porsche automobile. The owners of the museum gave me the opportunity to photograph my GT3 with the Typ 64, and despite the huge size difference and almost 80 years of age between them, each is recognizable as a Porsche, and they serve as fitting bookends to the parade of engineering innovators who have never stopped pushing the development of the rear-engined car forward. 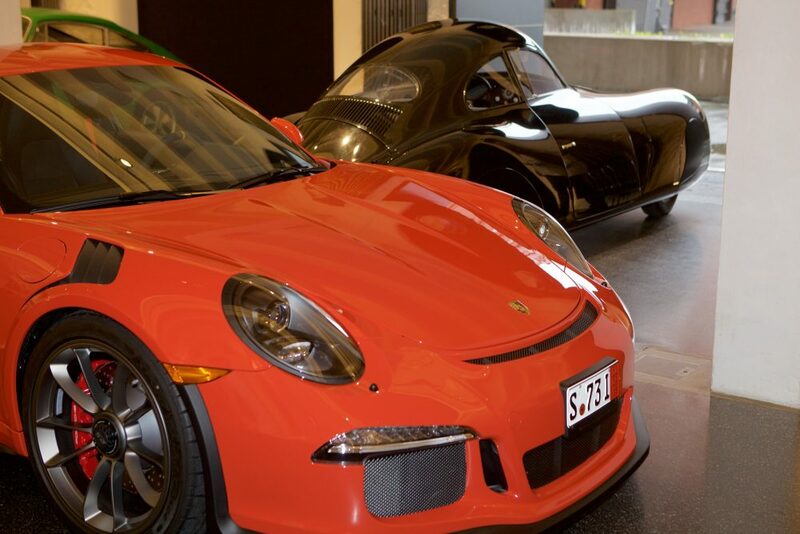 For any Porsche fan, this museum is a must visit. By this stage in the trip, I had a good feel for the new car. It was staggeringly fast, stone-stable at even the most extreme speeds, and for the first time, predictable in the rain. 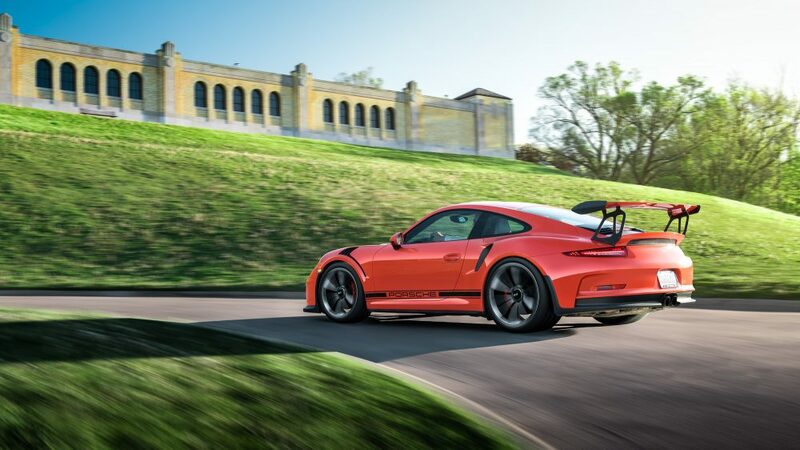 The 991 version of the GT3 RS made no compromises for performance, but unlike the earlier cars, it was as easy to drive as any other 991 would be. The aero package provided astonishing levels of downforce at speeds of only 140 km/h. 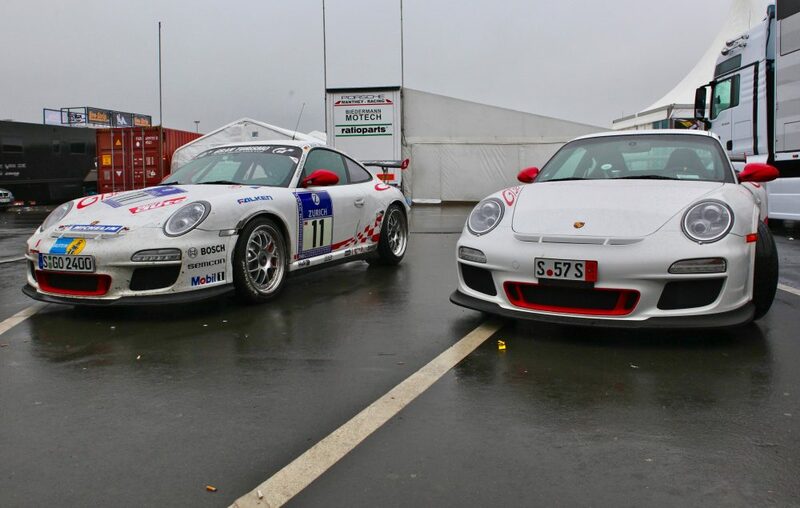 Handling in the rain was so much better than the 997s’ as to not merit a discussion. It was simply better. 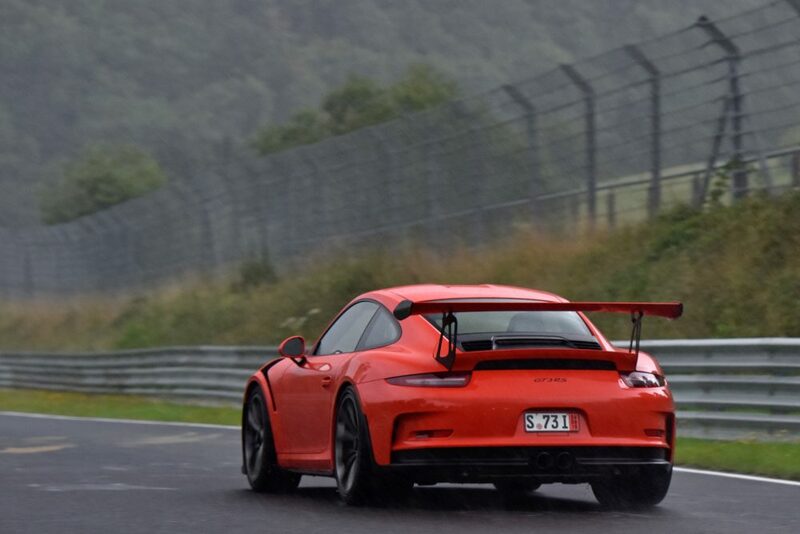 On a cloudy, damp day, I arrived once again at the Nordschleife. My new instructor Daniel Schwarzfeld was ready with the telemetry, but our first evening out was miserable due to rain and fog. It was a letdown surely, but then the announcement came that the F1/Grand Prix track would be open to compensate for the conditions on the full course. Unlike the narrow Nordschleife, the F1 track has all of the modern runoff areas and is much more forgiving than the North Loop. This meant that even in the rain, we tested the limits of the 991, for it is much easier to push a car when you know going off won’t result in unavoidable contact with a wall. In the water, the 991 bore not the slightest resemblance to the earlier cars, and it was amazingly sure-footed in these conditions. I tried driving it very badly on purpose and eventually triggered stability control, but it required going in to the turn too early and deliberately lifting off to trigger it. It was nice to know these systems were there to help, but the car is so well engineered that its mechanical and aero-derived grip is often more than enough on its own. We would have an opportunity to return to the full track the next day, though it was still a rainy affair. 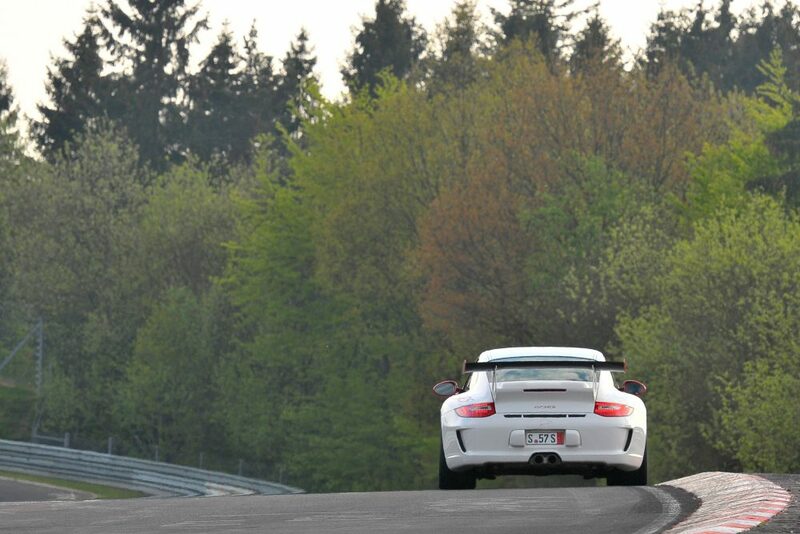 The 991 again impressed with its grip on the more demanding circuit. Taking a sharp right-hander at one point, I came face to face with a Subaru WRX which had hit a fence and was now pointing towards me. Heart in mouth, I managed to avoid him, but there is no doubt that I would not have been able to make the same move in the earlier cars. It was the fastest car with the most downforce of any I had ever driven on track, but it was also among the most composed and refined. 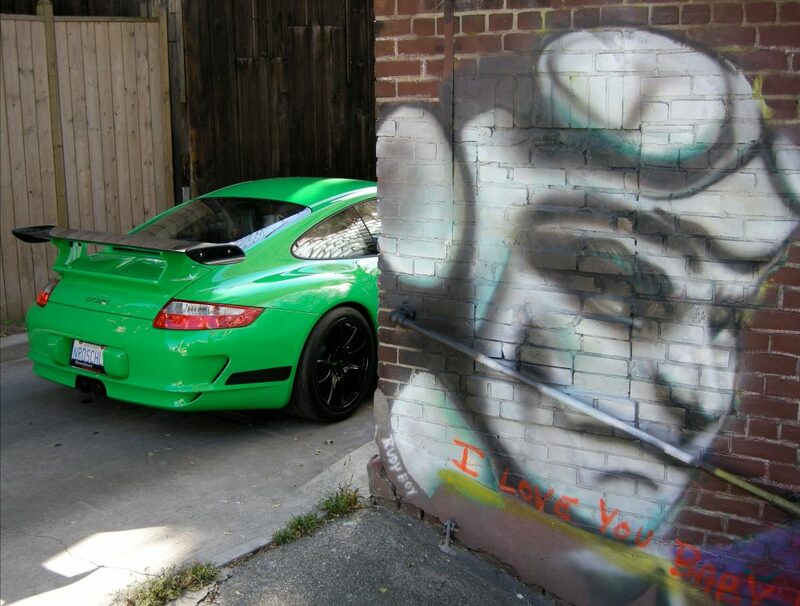 Much has been written about the lack of engagement in the PDK cars, but I cannot understand why. Taking this car up towards its limits, there is an intense involvement required from the driver not because the car starts getting out of sorts, but just because the speed is so great. The involvement is total when you’re winding this car up, so much so that you rarely regret not having a clutch pedal. 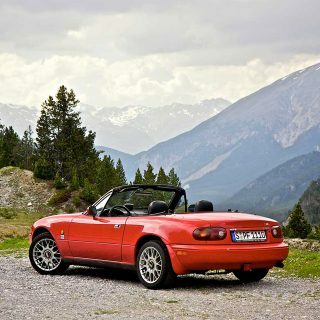 There is great enjoyment with the earlier manual cars, but this one is just different rather than inferior. Like my green one, I doubt if I will ever sell it. So, what comes next in this rapidly changing world of EVs, hybrids, and regulatory reform? 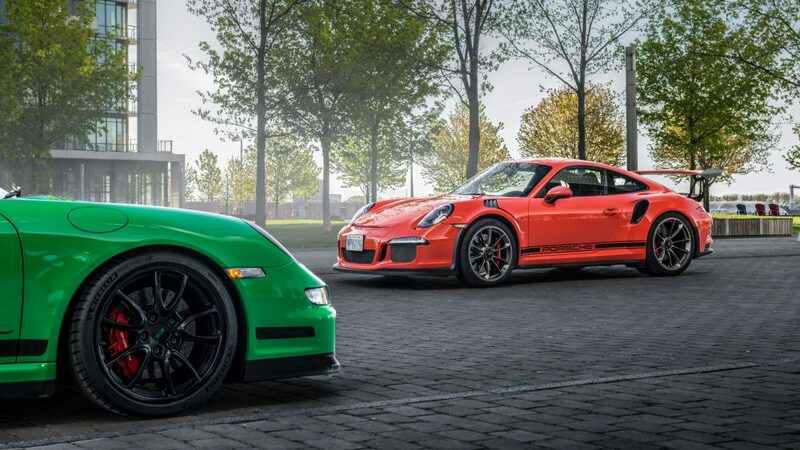 Hopefully a 992 GT3 RS in the future to keep company with its older siblings! Maybe one day in the future the phone will ring again and Antje will deliver another dose of good news, which will of course be followed by another trip to the most unforgettable race track in the world. Hi Ronan, we know what we are talking about. The NS is again and again an fantastic experience. I started with 22 years driving there. That make things easier. Find attached two books for long winter evenigs. May be I see you in June at the NS. Thant you for sharing this great story. I saw the pictures and could stop reading. I did my first lap at the Nordschleife in 1977. Until now a have about 1.000 lap, but on two wheels. I’m addicted as you and can feel what you meant. Good for me. I live in Germany 130 miles away. I think it is much scarier and more difficult on a bike. You are braver than me!…The NS is a thrill no matter which Mose of transport you choose. Glad you enjoyed the story. Will be there in June. Never drove a station wagon on the NS but the Panamera Turbo Sport Turismo is on deck for then. Need a DD. You should be aware the the NS 24 is two weeks earlier in 2018 and is in May so the track will be closed for a while around the time. Good to hear from you! p.s should be there next may all going well with .2 allocation! Ah Ed was one of the best … R.I.P Ed! Great story! and thank you for sharing, I felt like I was inside of the car for the most part. 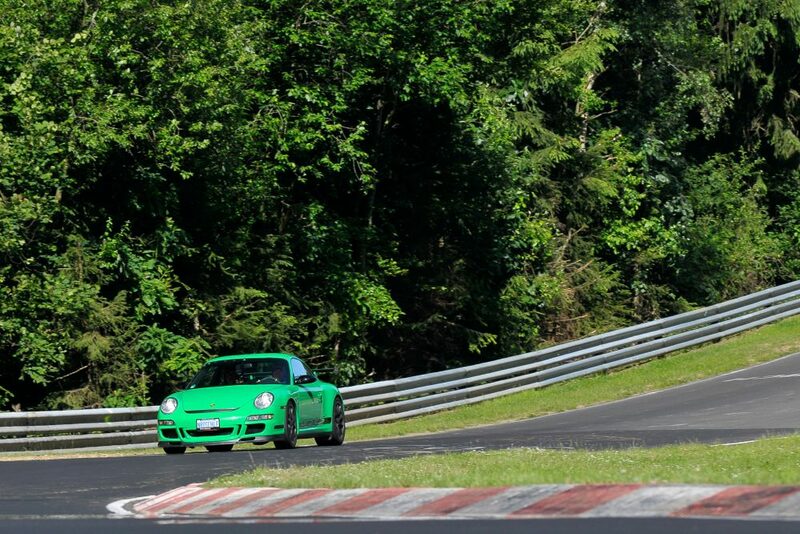 Wondering how does one ship a car from North American to Germany and back to drive the ‘Ring? Is it prohibitively expensive and fraught with potential for customs screwups? It was about $15k to ship it, including the transit insurance. Additionally I had to get road insurance for Germany and third-party track insurance. Customs was no problem-usually the shipper will clear for you. I picked the car up at German customs in Frankfurt. 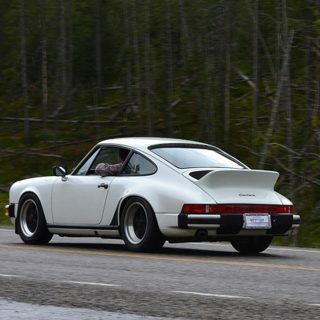 The car retained its Canadian plates throughout the visit, so no difficulties there. In general I would only do it on an exceptional basis. The best deal is to do factory delivery and track that car that way. 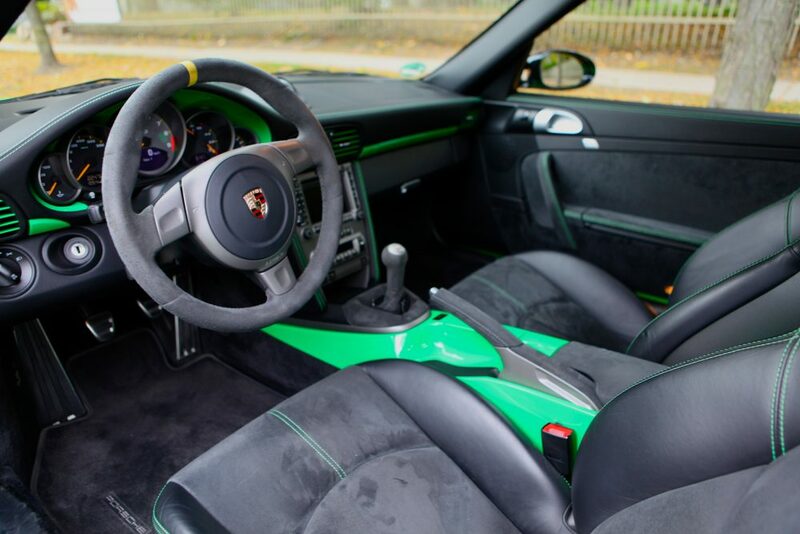 I had the 991RS get its plastic skin an host after I picked it up ,so no paintwork damage. actually if you can RoRo it the cost of transport is not so bad, the hard part is actually finding insurance for the car while it is temporarily imported into the EU. Interesting story and beautiful cars. I was trying to figure out the Canadian location and then saw the pictures in Toronto down in the Beaches made obvious by the south facing facade of the historic RC Harris WTP. Well spotted. It is a magnificent building.